In addition to payments that are recorded (within the period 1537-1540) to “paintres et pouppetiers…pour avoir vacqué aux meslées de terre, pappier et plastre pour la venue et réception du Sr Empereur, audit Fontainebleau …. “3 there are three other sixteenth century references to events of this visit that indicate the work of artists. The first is a mere two lines in René Macé’s poem Voyage de Charles-Quint par la France (Macé, ed. Raynaud, 1879, 29): “Le Roy ayt faict en son Fontaine Bleau / Pour l’Empereur feu merveilleux en l’eau.” Rosso could have had something to do with the structure that would have been built to support this firework display that was very possibly placed on or very near the large pond adjoining the terrace on the south side of the Gallery of Francis I. Another short description of the decorations at Fontainebleau is in Item le honorable Recueil qui luy feit le dict Roy tres christien, a son entree du chasteau de Fontayne Bleau. Lan M.D.XXXIX, Lille, 1539.5 The emperor is mentioned as approaching the château, “a l’e[n]tree duquel estoie[n]t plusieurs arcz de triu[m]phe, ausq[ue]lz estoient les armes de l’e[m]pereur & estoit lentree du chasteau toute couverte de buix verd, p[ar] carreaulx & losanges, et au dede[n]s du chasteau estoie[n]t en plusieurs lieux les armes de l’e[m]pereur avec sa devise, Plus oultre, et au milieu de la court du chasteau estoit ung arbre, du q[ue]l sortoit feu & eaue, & la devise: Qui pot[est] capere capiat.” Here several arches of triumph with the emperor’s arms are said to have been at the entrance to the château. Also it would seem that the entranceway was covered with boxwood branches forming squares and lozenges. Elsewhere, too, his arms were displayed with his motto: Plus oultre. The column described in the Cronique is here given as a tree, on which another motto appeared (from Matthew, XIX, 12).6 The tree is said to be in the middle of the courtyard of the château. This could be the same location indicated in the Cronique as on the pond in front of the château, that is, it would seem, the terrace flanking the south side of the Gallery of Francis I. “…Sa Maiesté ayant envoyé au devant de luy hors de la Forest un nombre de Princes, de Seigneurs, & de Noblesse, tous avec le plus grand éclat d’habits, qu’il se peut voir. “Entrant dans la Forest, il fut accueilly par une troupe de personnes déguisées en forme de Dieux, & de Deesses boccageres, qui au son des haut-bois s’estans assemblez, & accourus, composerent une danse rustique, qui ne fut pas moins agreable en la bigearre façon dont ils estoient revestus, qu’en l’ordre, & aux passages qu’ils renoient; lesquels ayans ainsi dansé quelque temps s’écarterent promptement de part & d’autre dans la Forest, & l’Empereur poursuivant son chemin arriva icy. “Le soupé estant preparé en la Salle du Bal, le Roy qui avoit laissé quelque temps l’Empereur pour se reposer à loisir, l’alla prendre en sa Chambre, et ils vindrent ensemble souper, avec un témoignage de part et d’autre d’une grande réioüissance. There are two items in Dan’s account for which Rosso could have supplied the designs, the costumes of the dancers who were dressed as woodland gods and goddesses, and the triumphal arch, placed at the entrance to the château (the Porte Dorée), which was decorated with trophies and with paintings showing the king and the emperor dressed as antique figures and accompanied by personifications of Peace and Concord. Vasari said that of the decorations that were made for this occasion half were designed by Rosso, the other half by Primaticcio. Unfortunately, no visual evidence survives that is certainly related to these decorations. Even the literary evidence is scant and indicates so few items as to make it seem that there was little to be divided between the two artists. This may well have been the case, as the decorations of the château itself, which were just recently completed, would themselves have provided a sumptuous setting for the emperor’s visit. Given Rosso’s experience designing the arch for the entry of Leo X into Florence (L.12), and given also that he seems to have been the “capo generale” of the work at Fontainebleau, he may have assumed the role of designer of the triumphal arch at the entrance to the château, or several arches there, as stated in the honorable Recueil, and of the large flaming column from which issued forth wine and water (and probably not a tree, as stated in the same source). 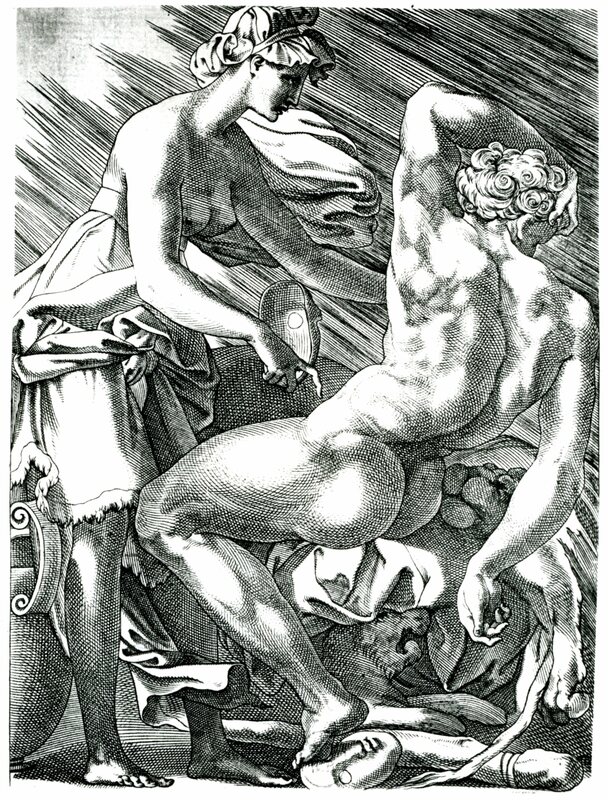 Rosso could also have designed the costumes of the woodland gods and goddesses. 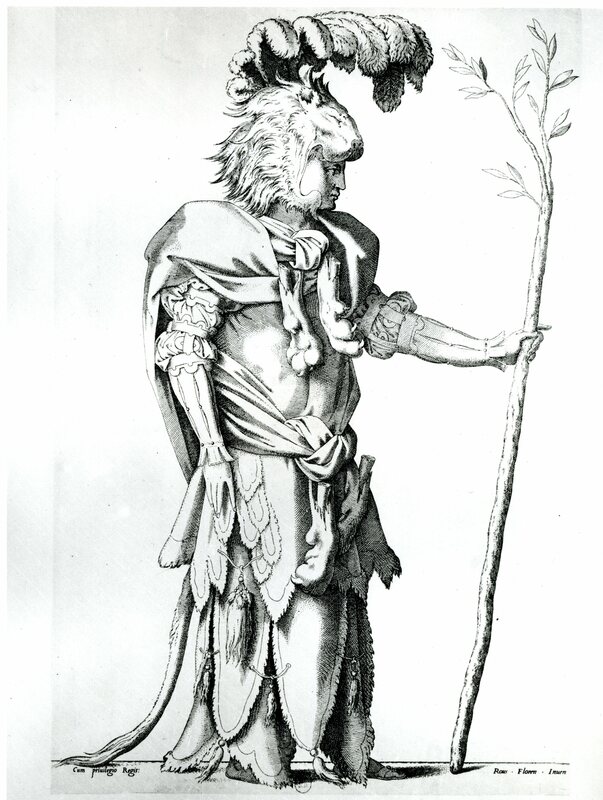 Rosso’s Figure Costumed as Hercules, known from an anonymous etching (Fig.E.160), may have been designed for these festivities; it is even possible that it is a costume design for one of the woodland gods. Hercules to symbolize Charles V was also employed, at the king’s request, as the subject of the silver statue that the city of Paris gave the emperor on 4 January 1540 (L.59). 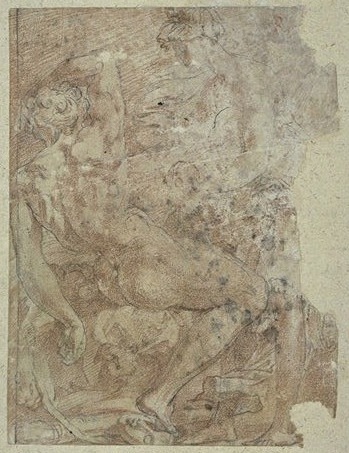 It is also possible that Rosso’s Dream of Hercules (Fig.D.78a, and Fig.E.17) may have been used for this occasion at Fontainebleau, perhaps for one of the paintings on the triumphal arch. On these possibilities, see Carroll, 1987, 31, 342-346, nos. 107 and 108, with Figs., and Chapter X.
References to the decorations made for this visit of Charles V at Fontainebleau, but without any visual evidence suggested, appear in Geymüller, 1898, 159; Dimier, 1900, 53-54, 379-380; Dimier, 1904, 89; Dimier, 1925, 34-35; Dimier, 1928, 8-9; Kusenberg, 1931, 106, 204, n. 267; Venturi, IX, 5, 1932, 198-199, with a wrong date for the visit; André Chastel, “Les Entrées de Charles Quint en Italie,” in Fêtes, II, 1960, 205; and Denieul-Cormier, 1962, 189-190 (1969, 134). 1 Tyler, 1956, 67, 335, stated that the emperor was at Fontainebleau on December 24 and 25, 1539, and in Corbeil on December 30. In Actes, VIII, 1905, 507, the king is recorded at Fontainebleau on December 25 and 26, but he was also there on the 24th when the emperor arrived. The king was at Nogent-sur-Seine on December 28. Both were in Paris on January 1, 1540. 2 See Guiffrey, Cronique, 1860, 275, where it is stated that the emperor made his request to pass through France on his way to Flanders around the end of September 1539. Charles V entered France between St. Sebastien and Fontarabie on 26 November 1539 (see Gachard, 1846, 44, n. 3). Grodecki, 1975, n. 12, noted Rosso’s absences from the meetings of the Chapter of Notre Dame in Paris, of which he was a member, from 16 September 1539 to 7 January 1540, and concluded these were due to a long stay at Fontainebleau needed to prepare for the visit of Charles V.
3 Paris, BN, ms. fr. 11.179, fols. 137-137v; Laborde, Renaissance, I, 1850, 404, and Laborde, I, 1877, 136. The payments that are recorded following the account that specifically mentions the emperor’s visit may also refer to the decorations that were made for this occasion. One payment names “Dominique Florentin” as one of the “paintres, pour vacqué esdits ouvrages, à raison de 20 sols par jour.” This would be Domenico del Barbiere; see Wardropper, 1985, 3-4, 314, as related to the preparations for Charles V’s visit to Fontainebleau (wrongly placed in April 1540). 4 Miller, 1977 (1966), 105-106, 116, n. 17, mentioned the column fountain cited in the Cronique, and reported the comment, without sources, of Maurice Toesca (Les Grandes Heures de Fontainebleau, Paris, 1957, 32) that its prestige waned when its mechanism was revealed. The column is also mentioned in Knecht, 1984, 296; 1994, 392. 6 I would like to thank Professor François Rigolot for identifying this passage. 7 In 1642 Dan’s “petite Galerie” would have been the Gallery of Francis I to distinguish it from the “grande Galerie,” known also as the Gallery of Ulysses.